Generations have scoured the seas around here, looking for the clues which connect the presence of huge clams in the ritual sites of Lamanoc, and the absence of such out-sized clams in the nearby sea. These clams, believed to be special vessels used by early pre-historic Boholanos in their offerings to the spirits, could be easily sourced out from nearby, but they have disappeared in time. Over harvested to near extinction in the following centuries, these giant clams were on their way to being seen only in books by the new generations, until the provincial government of Bohol decided to seed them back here. For this, older residents of Badiang Anda now saw the clams' return after decades. Last week, a team from the Office of the Provincial Agriculture arrived, carrying giant clams in ice boxes. These would be for re-seeding at the Badiang Fishermen's Association-managed marine sanctuary, off the mystical ritual island of Lamanoc. The giant clams are part of those which Bohol recently acquired from the University of the Philippines Marine Science Institute in Bolinao Pangasinan to re-seed Bohol waters, said Larry Pamugas, assistant agriculturist. Held in storage at the marine protected area (MPA) in Bingag Dauis to reacclimatize, the clams were then slowly relocated anew to enhance five marine sanctuaries over towns in Bohol. 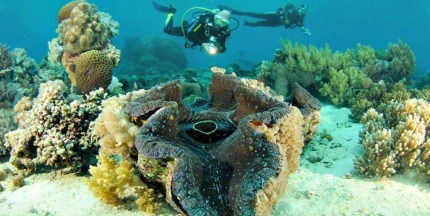 Anda Mayor Angelina Simacio was elated to get a share of the giant clams, saying that the clams can now complement Bohol's best-selling Lamanoc Mystical Tours. She also aired her confidence that the giant clams can produce their own food and contribute to the natural sources of food in the sanctuaries. They can attract other fish and marine species which increase biodiversity of the Badiang Marine Sanctuary, said a fisherman who doubles as a paddler for the Lamanoc Island Mystical Tour at daytime. Lamanoc Mystical Island Tour is a three-hour guided tour and trek in the established trails of the ritual island, which shows a generous number of giant clam shells in areas where rituals are offered. Lamanoc island got its name from the usual offering of white chicken to the spirits of the place, which a long string of shamans do. Also, by using giant shell clams as vessels in their rituals, many of these shells scatter the ritual altar grounds, some have been dated to several decades before the Spaniards set foot in Bohol. An isolated series island-like promontories in Bohol's southeastern part, Lamanoc is not exactly an island but is adjoined to Bohol mainland by a vast mangrove forest in barangay Badiang. Already considered by the residents as the abode of the spirits, Lamanoc has seen a horde of shamans from Bohol and outside who regularly visit this isolated patch of rocky promontories to re-invigorate, admits Fortunato Simbajon, community guide at Lamanoc. In the islands ledges, especially those facing the Mindanao sea, indications of early settlement can be traced in through the abstract hematite hand paintings in cave walls, sea stars among the most decipherable painted figures. A few more steps and you will see shards of broken jars, a few rotting dug-out coffin with traces of a skull with flattened forehead, laying beside conch shells and fossilized giant clams. The fact that you have lots of these shells in the ritual altars tells a big story of the presence of these marine creatures in Badiang, centuries ago, Simbajon said.